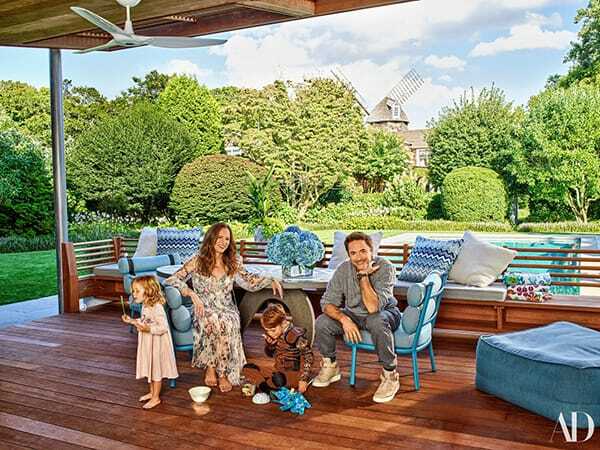 When actor Robert Downey Jr. and his wife, Susan Downey, decided they wanted a home in the Hamptons, they knew they wanted something special. 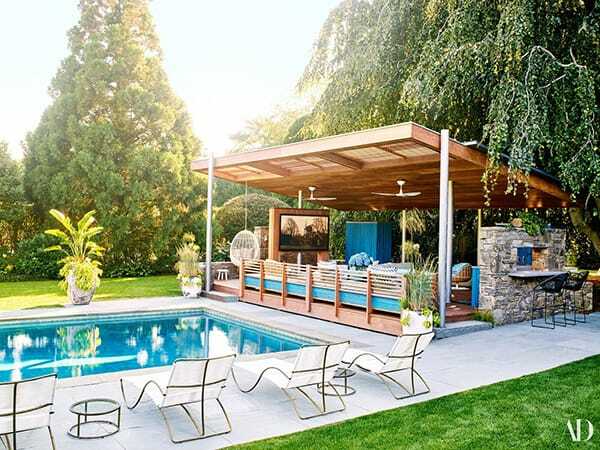 They enlisted the help of designer Joe Nahem and his team to find them a property that would be unique and he more than delivered. The home began as a 19th-century windmill folly that was originally meant to be a playhouse but was later expanded into a full-fledged home. With the help of Naham, the Downeys transformed the home yet again. The property is full of color and whimsy. It is bursting with character and personality, yet also manages to have a relaxing vibe to it that makes it the perfect spot for two jet-setters to unwind when they have the chance. 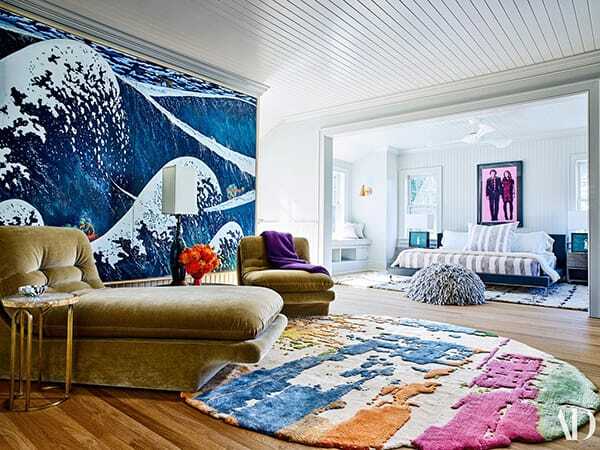 It’s an inspiring look at how you can infuse your personality into your home. After all, it’s your space, so it should reflect you. 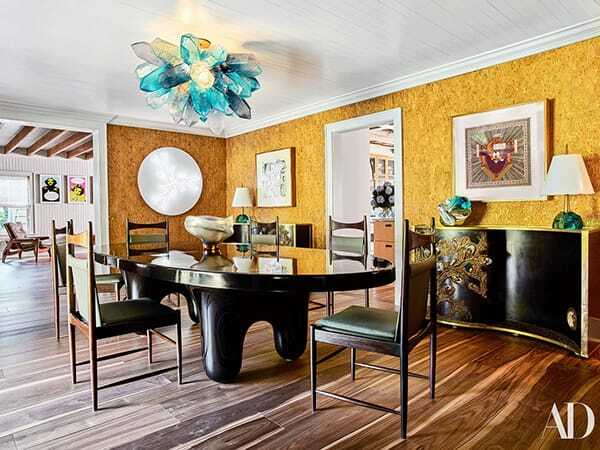 Here is the inspiring home tour courtesy of Architectural Digest. The home is charming and unique from the moment you drive up to it thanks to the windmill and praying mantis sculpture. 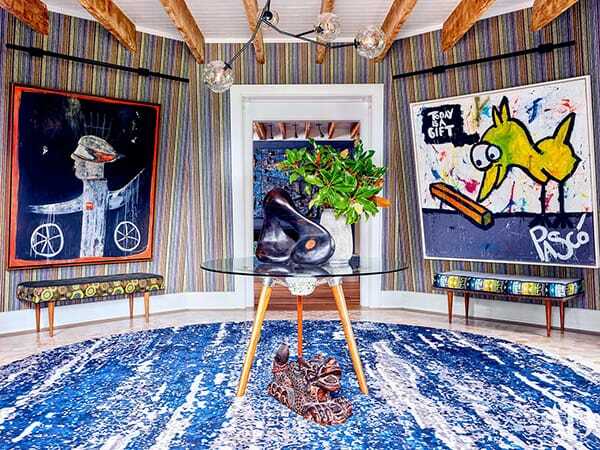 The entrance hall is an explosion of color and artwork that sets the tone right away. In the living room, an incredible fireplace created by a ceramic artist is the main focal point with more artwork and a sunken sofa to create a playful yet cozy vibe. 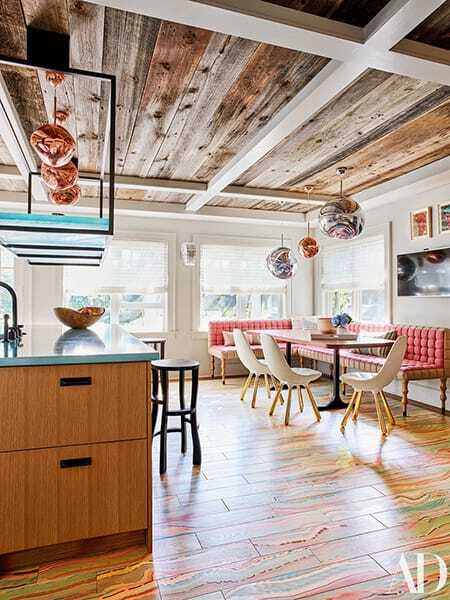 A wood-clad ceiling brings a rustic vibe to the eat-in kitchen while the colorful floors and a pink banquette bring the fun. The dining room is a little more sophisticated but still whimsical with an incredible illuminated sculpture serving as the chandelier. The master bedroom is a colorful retreat with wall-sized artwork, a colorful custom rug, and a portrait of the couple over the bed. The bathroom is fun and funky in pink and purple tile. 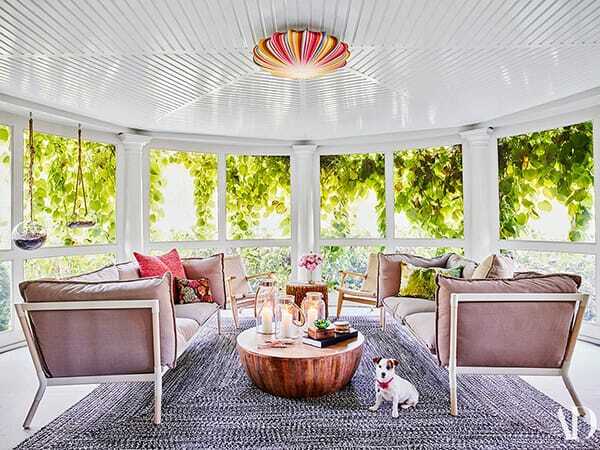 The porch is somewhat subdued compared to the rest of the home but still maintains the stylish, modern design. The pool area was made for movie lovers with a huge television and sitting area around which to entertain. Blue accents create stunning contrast with the rich wood and greenery surrounding the outdoor living area for a vibrant, though relaxing atmosphere. Such a cool and inspiring home!